Let's fire up the binary which we are given. Hmmmm...i can't seem to click on the button. I guess i have to click on the button in order to solve this. 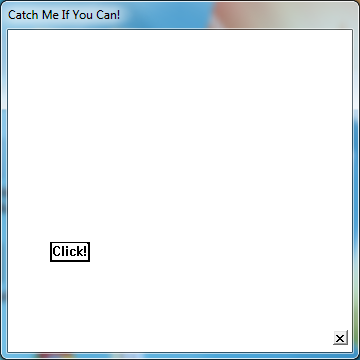 As the button moved away whenever i placed my mouse cursor near it. I guess i have to either reverse the application but i didn't want to spend too much time trying to reverse this application. Thus, I've decided to make use of my development skills to solve this puzzle. Since moving my mouse cursor near the button will cause it to move away. I've decided to send WM_LBUTTONDOWN (http://msdn.microsoft.com/en-us/library/windows/desktop/ms645607(v=vs.85).aspx) & WM_LBUTTONUP (http://msdn.microsoft.com/en-us/library/windows/desktop/ms645608(v=vs.85).aspx) messages with SendMessage function (http://msdn.microsoft.com/en-us/library/windows/desktop/ms644950(v=vs.85).aspx) to simulate the mouse cursor actions of clicking the button. But in order to do that i need get the handle to CatchMeIfYouCan.exe. 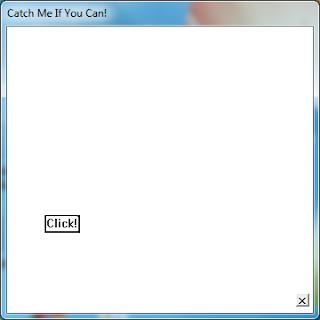 So i've used FindWindow function (http://msdn.microsoft.com/en-us/library/windows/desktop/ms633499(v=vs.85).aspx) to look for "Catch Me If You Can!" Once you have compiled the above code and get it to run. 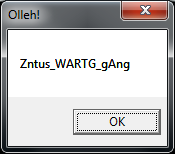 The button will stop moving and you can click on the button and you will be presented with a messagebox with the solution, "Zntus_WARTG_gAng"
I have attached the source code for the brute-force application so that you can try it on your own.